NASWellCube: Database with daily updates of official US & CA well data, covering over 320,000 wells and permits. It contains detailed analysis of well curves, pad drilling, re-frack trends and well economics to provide a complete well by well overview of the North American shale industry. NASReport: Consists of monthly insights on industry trends, forecasts (short and medium term) for both production and spending. Detailed analysis of key North American shale plays and operators and a deep-dive into well data for drilling, completion and productivity trends. Delivered electronically on a monthly basis and a hard copy version every year for the full year edition. Wolfcamp is the most active formation in Reeves, Ward and Loving counties as more than 70% of the total spudded wells drilled in these counties target that formation, as indicated in Figure 1. In Eddy County, however, operators are more diverse in their approach and not only targeting the Wolfcamp formation, but also the 1st Bone Spring, 2nd Bone Spring and Yeso formations. Figure 2 compares the cumulative production of Wolfcamp wells from different counties. It can be seen that in the first 10 months of production, Wolfcamp wells in Eddy County have the highest production compared to Wolfcamp wells from other counties. However, we see that Wolfcamp wells in Reeves County outperform the other counties after 12 months of production. The Wolfcamp wells in Ward County have the lowest cumulative production among these four counties. The differences in well performance can be explained by the completion techniques used for these wells. Figure 3 provides a quick insight into average lateral length, proppant and fracking fluid used per well, for all Wolfcamp wells completed in Reeves, Loving, Ward and Eddy counties during 2015-2016. Due to higher completion intensity, the Wolfcamp wells in Reeves County achieved better results when compared to Wolfcamp wells in other counties. The average proppant use per well for Wolfcamp wells in Reeves and Eddy counties is about 9,600 and 8,400 thousand lbs, respectively. The average proppant use per well in Ward County only averages around 7,300 thousand lbs, which is about 24% lower than the Wolfcamp wells in Reeves County. Additionally, there are large differences when it comes to fracturing liquid volume. The Wolfcamp wells in Reeves County have an average fracturing liquid volume of 10.7 million gallons per well, whereas wells in Ward County average around 7.5 million gallons. The Wolfcamp wells in Reeves County also have the highest average lateral length of 6,000 feet, followed by wells in Ward County with average lateral lengths of around 5,770 feet. The Wolfcamp wells in Loving County are the shortest among all counties with lateral length averaging 5,400 feet. In conclusion, the wells in Reeves County are completed with much higher intensity compared to others. As a result, the costs of the wells in Reeves County are also higher, as shown in Figure 4, with an average well cost of about 7.5 million USD. 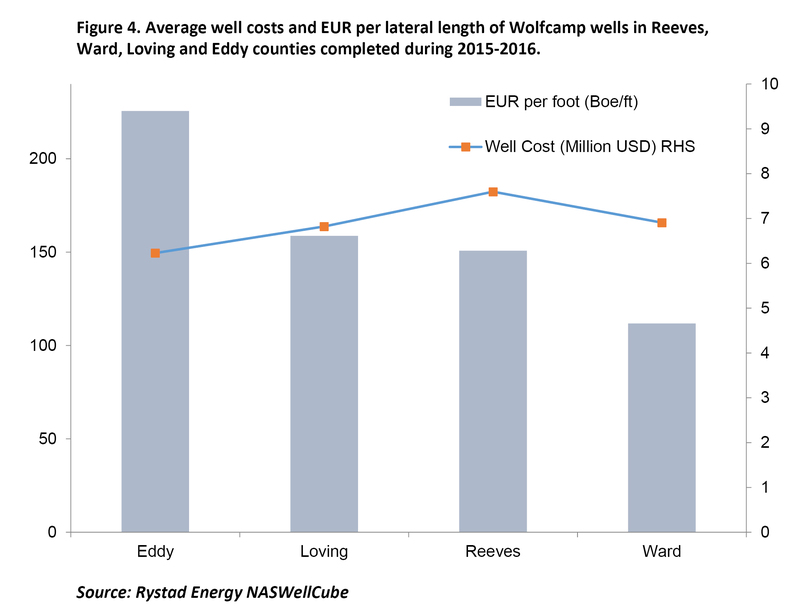 The Wolfcamp wells in Eddy County have the highest EUR per lateral length and also the lowest well cost. Loving and Reeves counties have similar EUR per lateral length, whereas Ward County still ranks the lowest. Lower well performances in Ward County are due to the wells being completed with much lower proppant volumes and fluid intensity per well.